Last month, the International Labor Rights Forum (ILRF) released a report entitled "Missed the Goal for Workers: the Reality of Soccer Ball Stitchers in Pakistan, India, China and Thailand." The report details a variety of abuses, from child labor to hazardous working conditions to the practice of hiring temporary stitchers, leaving the workers vulnerable to exploitation. The report notes that, despite a commitment in 1997 to end the use of child labor in the industry, children are still sewing soccer balls. Moreover, even as the apparent crackdown on child labor failed to eradicate this practice, it also did nothing to address the poor working conditions in the industry, according to the report (In one Chinese factory, workers were found to work up to 21 hours a day during high seasons and without one day off in an entire month). The report concludes, "Over a decade after the signing of the Atlanta Agreement child labor still exists in the soccer ball industry. As the preceding data clearly demonstrates, although action was taken to eradicate child labor in the late 1990s, very little was done to end its root causes. The parents working in the soccer ball industry are still receiving next to nothing for their work. They are working as temporary or casual employees and therefore receiving none of the benefits that can keep their families healthy. Despite each countries’ cultural and governmental differences, the soccer ball industries in these countries share the same problems: casual or temporary work, poverty level wages, discrimination, restriction of the right to organize or collective bargain, and health and safety violations." The ILRF is using this report to put pressure on FIFA to take a lead in eradicating the use of child labor and abusive labor practices in the production of soccer balls. While the World Cup has concluded, it will take consistent efforts to end this abuse. The ILRF is conducting an email campaign to Joseph Blatter, president of FIFA. In addition to putting pressure on FIFA and the professional wing of the sport, we can also take action to end abuse and ensure fair labor practices through the products that we buy. 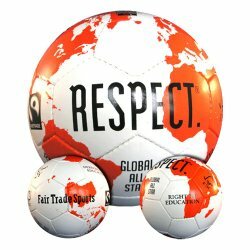 Soccer enthusiasts and other sports players can check out Fair Trade Sports, which sells soccer balls and other sporting equipment that is certified Fair Trade and certified green. Please see an example, pictured above.